Some of my favorite mobile games for the mobile platform are of the puzzle genre, because it tends to lend itself well to the array of controls that are provided. A new THD game that just landed in the Market today, however, combines simple controls and some quirky physics to give you a unique puzzling experience. 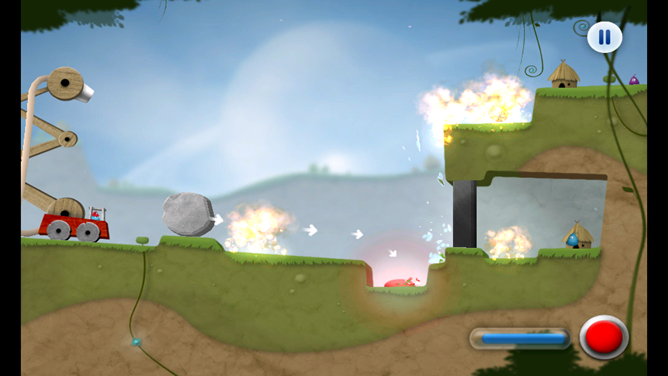 In Sprinkle, you are put in charge of a small village's fire department, who are in turn in charge of extinguishing fires that are caused by falling meteorites. Since the citizens of this village live in thatched-room huts (despite having the technology for a high-powered hose), you can imaging that fire is pretty bad for them. So, when put in control of the water cannon's height and angle, you must put out fires and solve puzzles all by using the pressure of your hose. 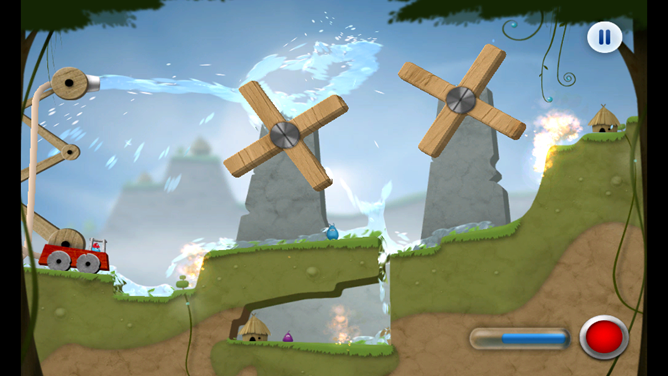 There are also certain environmental objects (like windmills, cogs and small crevasses) that will either help or hinder you on your quest; this adds variety to the levels, and gives you some innovative challenges to play around with. First of all, I'm going to have to say that the way the water in this game looks and acts is downright gorgeous. 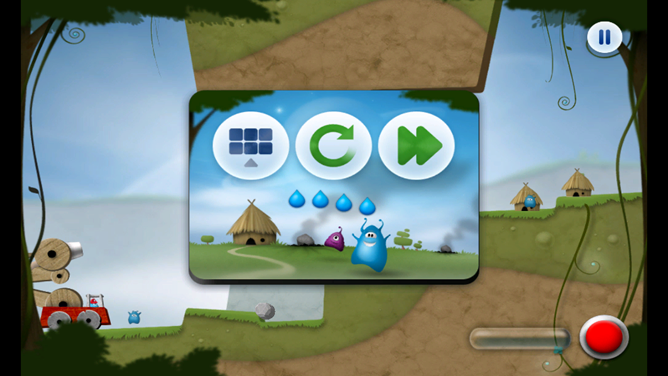 The way it flows and reacts with volume works to sell the whole puzzle motif and makes for an unpredictable playing experience. 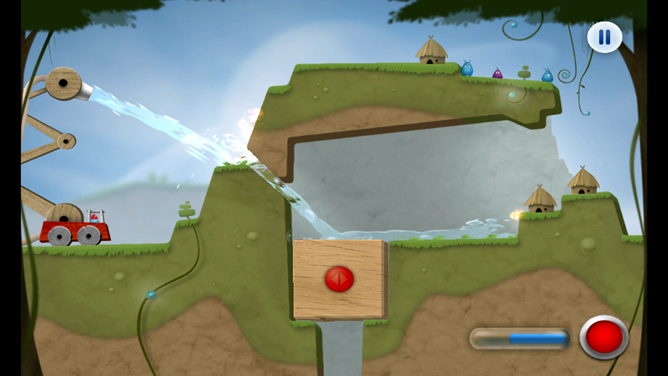 Water reacts to gravity, pressure, and texture to flow, spray and maneuver. The firetruck itself is simplistic in its design: you can tilt the nozzle for a different angle, or move it up and down. You can pretty much hit any point on the map with these two combinations, which I'm thankful for. As I've outlined before, sometimes the most direct way to get fire out is to just spray, not play with props. I'm also a big fan of how they've based the scoring system on the amount of water you have left in the tank, as there are too many variables in place to rely on variables like completion time. With meteors making entrances during the levels and the unpredictability of the fire, trying to rush players in the interest of more collectables would be all kinds of annoying. The only thing I don't really like about this game is that there is little in the way of hit confirmation when you are spraying water; it's difficult to gauge when fire is actually put out, or if you're affecting at all. This becomes a problem when the game's scoring system is dependent on how much water you have left. It's hard to strategize your course of action and play for the most points when you're left wondering "Is the fire out now? How about now?" It's a bit frustrating, especially when there's no visual indicator of how damaged the houses are. Sometimes it'll end up becoming a decision of whether to play the level "properly" (by using the props) or just completing it any way possible. 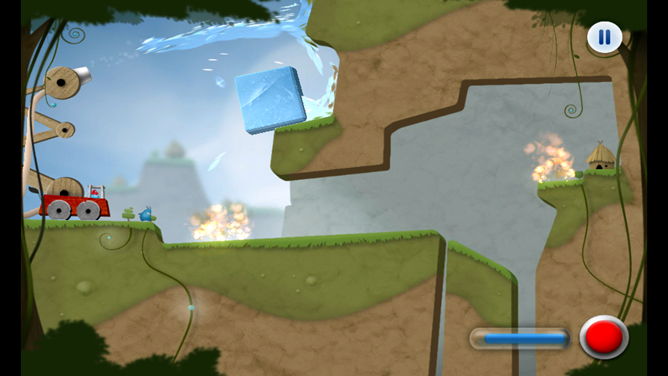 While it's true that some props are needed to finish a level, sometimes they don't always work the best. I've found that in certain maps, the water will react in a way that works against the blocks you've moved, or the bridges you've formed. You'll end up spending more water than needed to get around these problems, which, again, is a bit counter-productive to getting a score you want. I guess what I'm trying to say is that the fire and water are equally unpredictable, which I don't enjoy from a game that is trying to reward me for my logic. I shouldn't have to cross my fingers and hope this works. 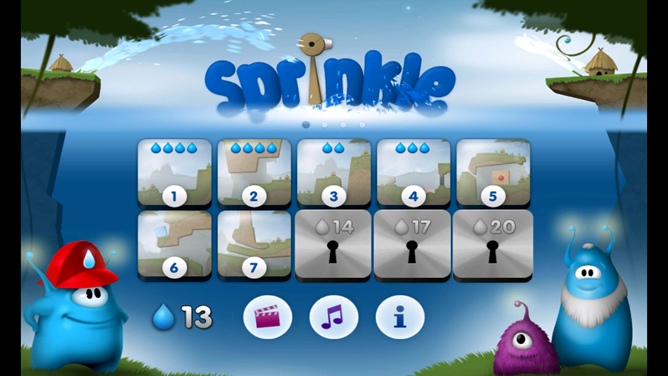 For a THD title, Sprinkle has made the wise move of putting functionality and puzzling experience before the presentation of the game. While the water effects are the game's selling feature, they aren't obnoxious, and work extremely well. Given the game's $1.99 price tag, this is definitely a must-have for anyone with a Tegra-powered device. It's worth noting, also, that the developers are already actively working on a version for Project Kal-El, NVIDIA's quad-core Tegra 3 processor. We've seen what a huge difference two more cores can make when NVIDIA demoed Glow Ball, and a game like Sprinkle can only benefit from the addition of more processing power.